After eating dairy, do you notice symptoms like itchy skin, eczema, wheezing, congestion, runny nose, or watery eyes? What about stomach pain, gas, nausea or bloating? These days, large numbers of the population avoid dairy because they experience such symptoms after eating anything containing milk or cheese. Call it lactose (milk sugar) intolerance or a dairy allergy, but often these symptoms are more likely caused by difficulty digesting the protein casein. Casein is the main protein found in milk and is also used in many food products as a binding agent. Casein is even present in lactose-free foods and products as varied as soy cheese and nail polish! Casein has also been linked to negative effects in children with autism, ADD, and ADHD. Autistic children (and anyone else who experiences low stomach acid, poor digestion and inflamed intestines) react in a very negative way to this dairy protein. Casein enters the open, permeable and inflamed gut wall and your body attacks this protein, seeing it as an enemy. You will experience a negative allergic reaction and most likely will notice a drug-like effect on your central nervous system and experience brain fog, excess mucous and lethargy. 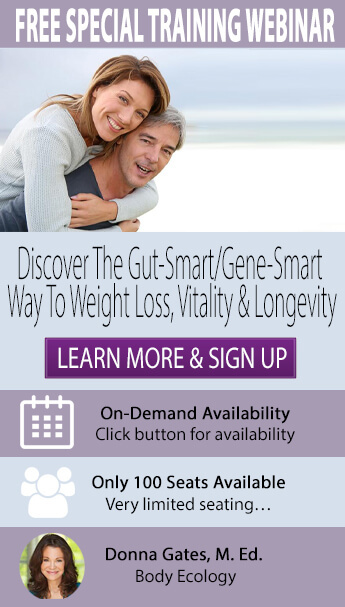 If you experience routine stomach distress, our Healthy Gut Summit or even Gut Health Recovery presented by Body Ecology founder Donna Gates, could be essential to getting your gut health back on track… Learn More Now! One of the main goals of the Body Ecology Diet is to establish a healthy inner ecosystem by adding healthy microflora (healthy bacteria) to your intestines that help correct digestion and improve the absorption of nutrients - like casein. Consuming fermented foods and drinks is a great way to populate your gut with healthy bacteria. Kefir made from goat or cow's milk is a delicious fermented drink that can be consumed in stage two of the Body Ecology Diet. But as this kefir from goat or cow's milk does contain casein it is best to wait until you heal your intestines and establish a flourishing inner ecosystem before adding it into your diet. While your inner ecosystem is healing, you can still get the same microflora found in milk kefir by consuming casein-free young coconut kefir. Young coconut kefir has been known to stop sugar cravings, cleanse the liver, aid digestion, and even enhance your complexion! Kids and adults love the bubbly taste and with a little stevia, it can replace your desire for those unhealthy soft drinks. You can easily make young coconut kefir at home by picking up young green coconuts at a local health food store or Asian market. Once you get the hang of it, making young coconut kefir takes less than 10 minutes. To get a wide range of healthy bacteria, you can use Body Ecology's Kefir Starter or Essential Duo. Using both, either together or in rotation, allows you to get a wide spectrum of the most fundamental beneficial bacteria that should be colonizing inside your body. Stay tuned for next week's newsletter, which will include a spotlight on how you can use and benefit from the differences in our starters. Though we've been taught to "drink our milk," improperly digested casein can cause skin, respiratory, digestive and immunity problems. Young coconut kefir provides a great alternative for kids and adults alike as your inner ecosystem heals. Eventually, you may add dairy products back into your diet, including nutritious milk kefir. You'll know when the time is right based on how you feel. And, of course, you will want to honor the Body Ecology "Step-By-Step Principle." Start with a small amount of milk kefir diluted with water and slowly increase the amount you drink every four to five days. This way the microflora in your inner ecosystem can adjust to the new food. If you experience stomach distress, you will also find that the Understanding the Leaky Gut CD by Body Ecology founder Donna Gates is an invaluable resource.